These are from the Betty Crocker Website and were a big hit when I made them for a Samhain/Halloween Party two years ago. I found them on WITCHY WISDOM. 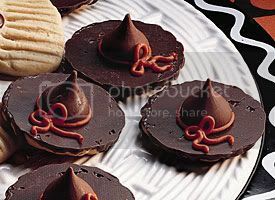 Attach one Chocolate Candy to the Chocolate bottom of each Cookie, using Decorating Icing. Pipe Decorating Icing around base of Milk Chocolate Candy. Stir in the dry ingredients until well blended. Drop by half-teaspoons on ungreased baking sheet. Bake 8-10 minutes, and cool slightly on baking sheet before transferring to tiny plates. Combine liquid ingredients with crushed ice in a mixing glass. Combine oil land soy milk and whip for 1 minute. Pour into dry mixture and mix until thoroughly combines. Don't worry about the lumps. Preheat a lightly oiled griddle or large skillet. When a few drops of water sprinkled on the griddle bead up and roll off, the griddle is ready. Pour 1/4 cup of batter at a time onto the griddle. Cook at medium high heat until the pancakes begin to bubble, about 3 minutes, and the bottoms are lightly browned. If the pancakes bubble up before the bottoms are browned, raise the heat slightly. Turn with a spatula and cook until the second side is lightly browned. Serve at once with natural maple syrup, natural fruit syrup or Fairy Dust. Mix the coconut and date sugar in a mortar and pestle and grind into a fine powder. 1/4 cup margarine or butter. In a large saucepan over low heat, melt margarine and chocolate, stirring until smooth. Lightly spoon flour into a measuring cup; level off. Stir in flour, sugar, walnuts, baking powder, salt, and eggs; blend in well. Cover; refrigerate at least 1 hour for easier handling. Shape mixture into 1 inch balls; roll in powdered sugar (coat heavily). Bake at 300 degrees for 15 - 18 minutes or until edges are set. Remove from the cookie sheets immediately. Place the margarine and sugar into a bowl, mix together well until margarine is soft and no sugar remains in bowl. Place the eggs in a separate bowl, and beat well. Add the beaten egg a little at a time to margarine and sugar, mix together well. Sift the flour into the mixture, add the salt and fold well. Spoon into greaseproof muffin pan and bake in a pre-heated oven at 325°F for 20-25 minutes. When golden brown, remove from oven and place on wire tray to cool. Do not remove from muffin pan until cool. Can be served plain, or topped with icing or chocolate. Beat together softened butter and sifted confectioners sugar in a warmed bowl. Add well-beaten eggs and milk. Sift together flour, cornflour and baking powder and stir them gradually into the egg mixture. Flavor with vanilla and bake in muffin pan in a hot oven for 10 minutes. Ice with pink icing and dip in colored sprinkles. fry until golden brown. Drain on paper towels. Dip into the honey.